FINISH & INTERCHANGEABILIY: Polished stainless steel chain with two 13-mm stainless steel lobster clasps. It can match all interchangeable medical id tags and almost all others. 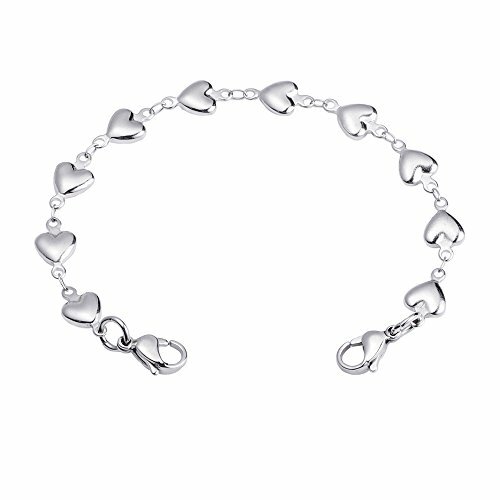 CHAIN MATERIAL: High quality hypoallergenic surgical stainless steel. 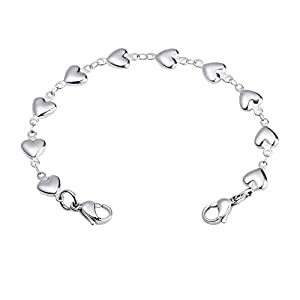 Excellent corrosion resistance and durability FEATURES:Heart Links,Suitable for any occasion, is a good choice for women INTERCHANGABLE CHAIN SIZE: This chain bracelet is measured from end to end in total length. Please measure the right size you need. TOTAL BRACELET SIZE: the sum of length from interchangeable medical ID tag + interchangeable chain + your desired comfort gap. The comfort gap can vary from 0.25 to 1.0 imch based on your personal preference.